In short, I had a great time – met a lot of interesting people, heard about some very cool projects and technologies, played with some new toys, plus got free food, free beer, free wifi and free T-shirts. I was in London Waterloo this week (to get the Eurostar to Disneyland!) and one thing I noticed was the posters advertising for volunteers to be Special Constables. I’ve sort of been vaguely aware of them before, but this was the first time I had a proper look. They have the same powers as regular police. They wear similar uniforms. They get “professional police training”. But they don’t get paid. I mean… they don’t get paid… but something about it doesn’t feel like volunteering. Is it a cheap way to get more police on the streets? I’m absolutely not trying to be negative about a role that I know next to nothing about, nor am I belittling the contribution made by anyone who wants to take on what looks like a very challenging role in support of their community. But it has got me thinking about what I consider to be “volunteering”. However, the idea feels a bit more topical at the moment so I think it is worth revisiting. The aim was to create something that would let me process my emails in Outlook Mobile (the cut-down version of Outlook you get on Windows Mobile PDAs and smartphones). “Processing”, rather than doing emails is an idea that I hear people mention more often since Merlin Mann’s brilliant Inbox Zero talk started doing the rounds as a Google video. I’m even hearing other people use it as a phrase from time to time! I used to call it “triaging” my email, but I think “processing” is actually a better term. 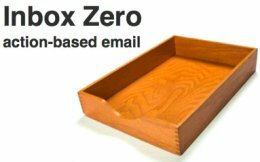 Either way, the idea is that I want to be able to go through my inbox as quickly as possible – doing something with each one so that I can finish up with an empty inbox. It doesn’t mean doing everything right away – just putting the information in it’s right place. If it’s an email asking me to do something, the right place for the email is in my Task List, not my Inbox. If it’s an email telling me about a meeting or appointment, then the right place for the email is in my Calendar. If it’s an email containing information that I need to keep for future reference, then the right place for it is in my wiki. If you are interested in the pain of writing MAPI plugins in C++, read on. If you are… erm… normal – then the short version is that I tidied up the code and made it available. Yesterday, I went up to Islington in London for a “fun” poker tournament. The entry fee was paid for by my wife as a surprise birthday present, and was my first experience of playing poker against people I didn’t know, or for more than £5 stake! The game was no-limits Texas Hold’em – with about eight people to each table to start with, and the top three players from each game moving on to the next table. Amazingly, I did quite well – winning on my first table quite convincingly, and making it through to the last two players on the last table. Where I got pressured into going all-in before I was really ready. Shame. A couple of new things to play with this weekend… the new del.icio.us and Spinvox. I got an invite to the preview of del.icio.us v2. I don’t know why I got one – could be entirely random, or maybe they wanted to include developers who have used their API in the beta. After a conversation with someone at IBM last week about PowerShell, I picked it up again and have been having a play. I’ve been trying to write my own cmdlets, which has been an interesting experience – so I thought I’d jot down a few quick notes about what it’s been like. First… a quick recap. Windows PowerShell is a command-line shell for system administrators. It has a number of neat features, but perhaps the most obvious is it’s object oriented approach – letting you pass objects (rather than strings) between commands in a pipe. I’ve done some work on writing PowerShell scripts before, but this time I approached it more as a developer – looking at how to extend the shell with new commands. The .NET nature of PowerShell means you can run any .NET API at the Shell. In fact, this is what I did when I first played with PowerShell using the WebSphere MQ .NET API. It’s a quick way to get started without having to learn much about PowerShell – and I played around writing some simple scripts that were a translation of C# programs into the PowerShell syntax. But it wasn’t really using PowerShell in the PowerShell way. What I have tried doing over the last couple of evenings is to extend PowerShell to include new commands that support WebSphere MQ administration work. I’ve been writing Cmdlets.